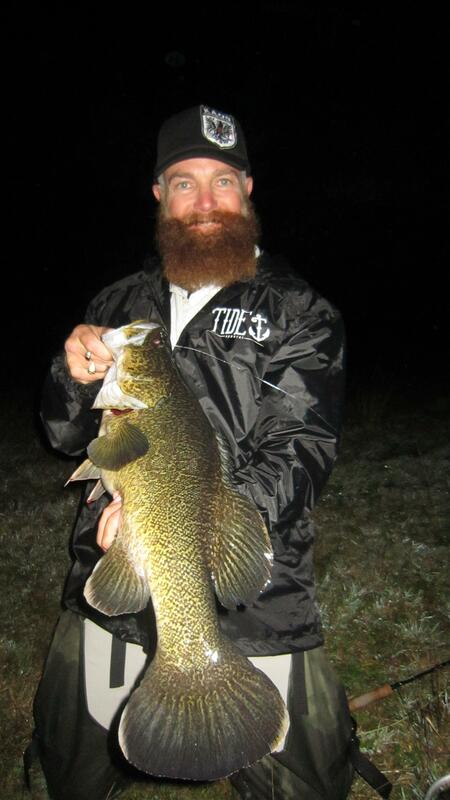 Winter Murray Cod Off the Top! There is an old argument among fly fishermen as to which is more important knowing where the fish are or being able to present the fly to them. Knowing where the fish are, is certainly nice however if you can’t reach them or present the fly you are simply not in the game. Even if you have no idea where the fish are but can cast well enough to cover the water with finesse you are likely to find success. The technique is to cast your fly across the river, small stream or lake close as possible to any structure. Immediately being to twitch, strip and rip the fly back in a similar way you might fish other large trout or saltwater flies. Often action is instant and cod boil at the fly being surface or sub-surface. A constantly moving fly will entice more strikes from the fish, than a non-moving fly, but a game changer could be the differences if that retrieve isn’t working. Quick 1 – 2 strip then a very long pausing, so long that it feels like you should tweak again – that’s the game changer right there! Even tho they may reject the fly, casting several time in the same location could produce another savage strike. Quite often the same fish will rise, boil and break the surface behind the fly. As the fly desperately swim away from the fish, it will finally take it with a huge swirl or splash and race off with it. The talk of the day and weeks to come will be all about you landing a fish on fly. Maybe you’re first time or the hundredth time, for me it’s always a great feeling and for your fishing partner as they get involved too by lip griping or netting the fish and also taking the photo. The bug is hard to shake once you have landed a native on fly and the only thing you talk about is the last time you were out hooking up or the next time you can get out on the water chasing these magnificent green backs. In your favor too around the camp fire while enjoying a yarn about how big you’re biggest is; or the one that got away. If you have caught a Murray Cod on fly and i can tell you now not too many anglers can say they have, you will always have a story to tell. Rob Meade Gutless Rat – Murray Cod Fly Fishing. 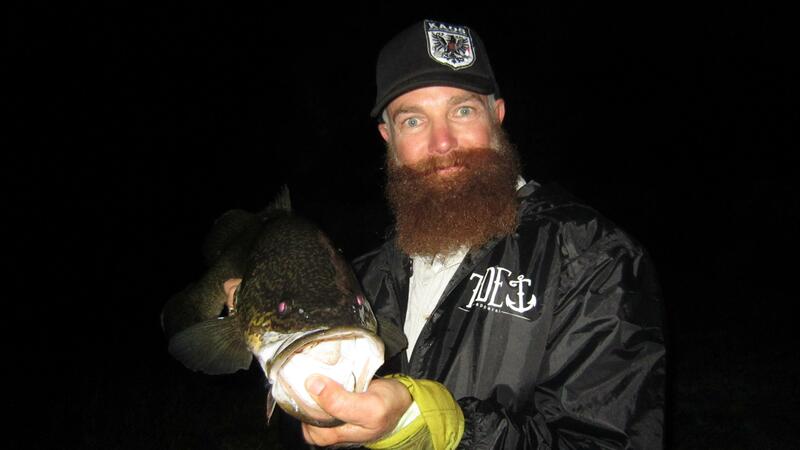 Kaos Cod Flys Murray cod Catch & Release. 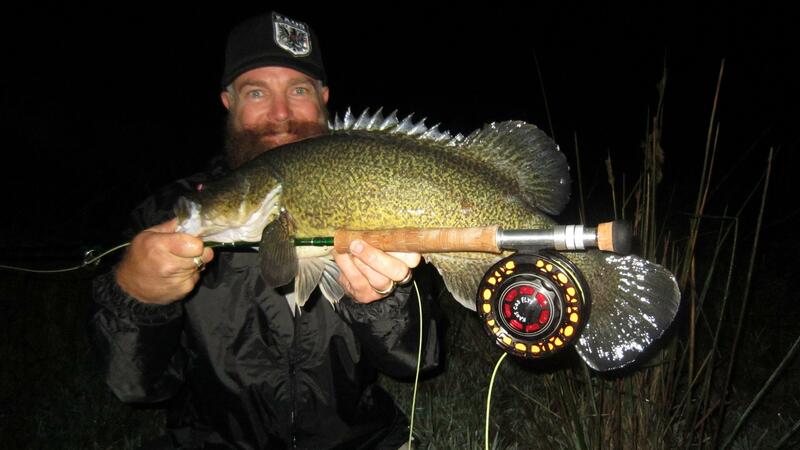 THE HUNGER OF MURRAY COD FLY FISHING! The journey of Ross (Virty) Virt and the famous named company Kaos Cod Flys! This began as a Hobie that soon branched out to a full/part time business. In 2008 it’s when I first cut my teeth tangling with Murray cod fly angling and from then I soon had a new passion casting big flies. The information research was very limited 5 years ago and it was dead end situation with only a hand full of very keen angler’s willing to share the knowledge. As most fly fishing anglers wanted to keep it a secret! With developing my own skills and reading and leaning as much as possible, my new found love was to revamp this sport to a new level! Not keeping the techniques quite but some of my locations, I had all the time in the world to share, build and join new relationships with very keen anglers to the art of Murray cod fly fishing. Kaos flies are designed and custom tied by myself for our Australian native fish using Australian and U.S components. Kaos is the number 1# distributor of custom tied flies’ for the tournament angler and for freshwater fishing anglers. They are hand tied with passion and attention to detail; ready for assault when you hit the water. All flies have been field tested in all conditions from far south in Victoria to central Victoria on the Loddon River, Lake Eildon, Lake Mulwala, Batlow N.S.W, Murrumbidgee River A.C.T, New England table land and other surrounding rivers and lakes of Victoria, N.S.W & Q.L.D with great results. Kaos Cod Flys is an exciting company that has brought to you the very best and latest in fly designs. Even tho Kaos are renowned for tying flies for Murray cod, these new and improved flies are built tuff and bulked up for all freshwater fishing being for big or small natives this includes: Yellow Belly, Barramundi, Saratoga, Sooty Grunter and bass. The flies are right up there with the best for quality, value, strength and toughness for all native fishing. I’ve taken no short cuts in their design keeping quality and value in mind. The bulk of these flies are second to none other; ideal for Murray Cod and all other native fish, the bigger profile is just irresistible to the fish. At the same time give great action though the water and easy to cast. Kaos flies fished the right way can be deadly to any native fish. Murray cod on the fly is an addiction which has slowly consumed my life to an extent that I’m never truly happy until I’ve caught my next cod, especially if it’s with a new fly I’ve tied. Recently I’ve really been taking that extra few moments to appreciate the fish I catch and enjoy the release. I promised myself that was I going to take that extra second to admire all the fish I catch. After too many amazing days with catches; I find myself thinking how it all happened so fast. How it was all a blur and asking myself why I didn’t slow down to enjoy the moment…Lots of fishless days in the tying dungeon make you reflect on things and come to conclusions. I’ve been taking the time to appreciate time with the fish and shoot a few photos of friends taking that little bit of time to appreciate the release, I’ve sure been glad that I have. I’ve been experimenting with fly fishing more over the winter periods the last couple of seasons and it sure wasn’t to disappoint me. As the skills I developed during this time I produced larger fish with each outing. Particular surface fly fishing during the cold winter nights, considering the moon phase, barometer and water condition these times can produce the goods! A cold winter night and it was the early hours of the morning about 2am when the commotion started. I still hadn’t landed a real monster I crave the monster that the Loddon River is so eminently capable of….As I work my way through the tiny pockets and main holes with angling partner SteveO. I placed a kaos cod zooka in the main current in my peripheral vision something huge and green rolled though the surface beside the structure. The fly was swiped of the surface were it lie when I experienced that supreme, magical moment that sets Murray cod fishing apart from all! A great table of black, glossy water rose up behind the fly and suddenly the fly was snatched from the fly line. Even before I could react, the rod buckled over wildly in my hands. An impossible bow-wave ploughed through the water and the frame of a truly huge cod rocketing though the water was resorting back to the depth of her dungeon. I felt a mixture of fear and adrenaline though my whole body. A 15 minute of tug of war and it was, the big girl surfaced for the first time, an intense moment Steve slid the cod in the net. Once hooked in to these fish and wait to be well rewarded you’ll soon realise what all the fuss about is! Epic fights – blistering short runs with incredible and dramatic power. Excited to say the least as at this moment words can’t explain! 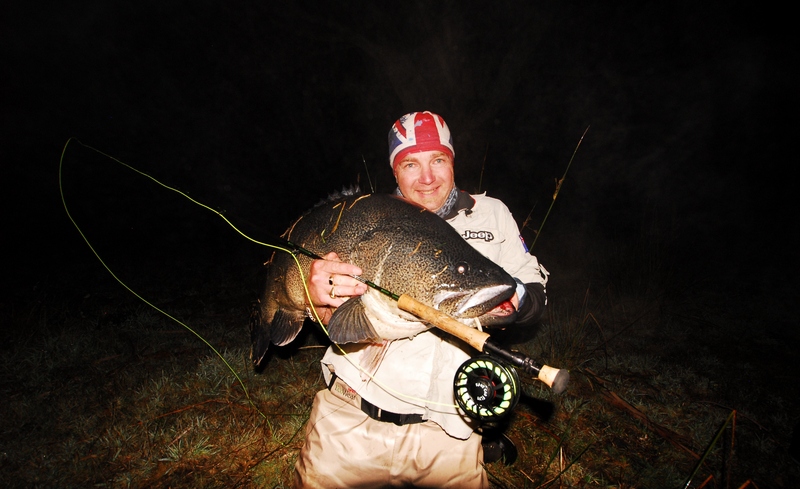 But ecstatic to announce that my new PB Murray cod on fly is 106cm – 30kg or 67lb and on the Loddon River! A short career in the fishing industry; only fly tying and fly fishing for 5 years. Owning my own Murray cod fly tying company for the same duration. Leaning a lesson or two from other anglers and educating anglers’ myself; as well as experimenting with tackle. Taking the good with the bad and keeping faith, goals can be reached and time on the water being proactive using the time wisely can result in long life dreams. Huge thanks to my angling mate Steve Bamforth. Not that he just netted a Murray cod of a life time but braving the cold conditions along the way. My original PB was 88cm fly fishing surface flies; now beating it by 18cm, the new PB of 106cm on fly is just amazing! A big shout out to all the anglers that have taken on this revamped sport, you want be disappointed with the outcome! I know it shouldn’t be in the closets as a secret society it’s just too good for that!